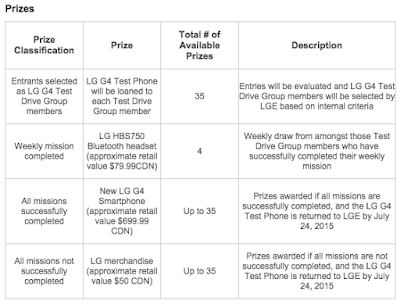 Contest LG G4 LG G4 Try Want a chance to try the LG G4 right now? Check this out! 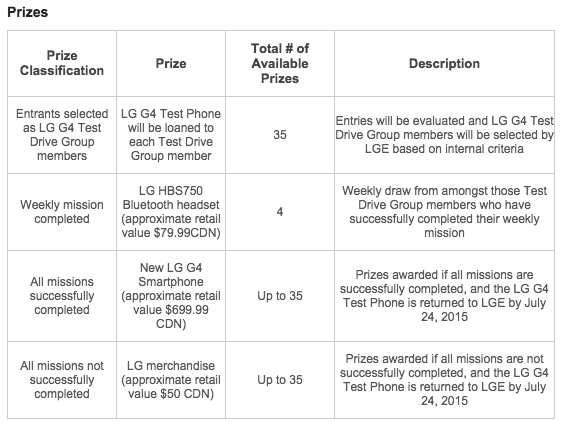 Want a chance to try the LG G4 right now? Check this out! Starting today May 12th until May 24th, you can enter @ trylgg4.ca! By the 26th you should get a confirmation if you've been selected for the test period. This goes from June 1st to the 30th which will entail having to complete weekly challenges, proof of which will be obtained with the phone's 16MP camera. You'll get weekly challenges that can earn you some interesting prizes!